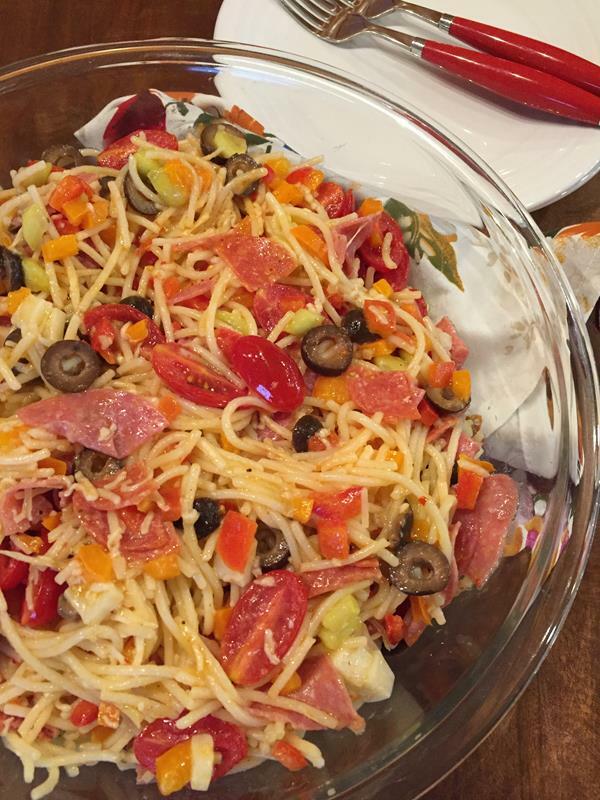 Italian Spaghetti Salad Recipe is a simple summer dinner. Summer is the perfect time to make a main dish pasta salad. They are easy to make, can be made ahead, and the leftovers work great for lunches during the week. I recently made three salads for a lunch meeting at my husband’s office. All three salads, including this one, were a a hit with the staff. I have made variations of this salad for years. The original recipe is an old Taste of Home recipe. I usually vary the recipe depending on what I have on hand. Most of the time I use penne pasta, but the original recipe uses spaghetti and that is what I used when I made it for the staff lunch. One of the best things about pasta salad is that it can be changed up with what you have on hand, what is in season, and what you like. For this one I used spaghetti, two kinds of meat, two kinds of cheese, peppers, tomatoes, and cucumbers. It was delicious. I also took my spinach salad, which I added chicken to in order to make it more of a main dish salad. I took my broccoli bacon salad and a new brownie recipe that I will share soon. 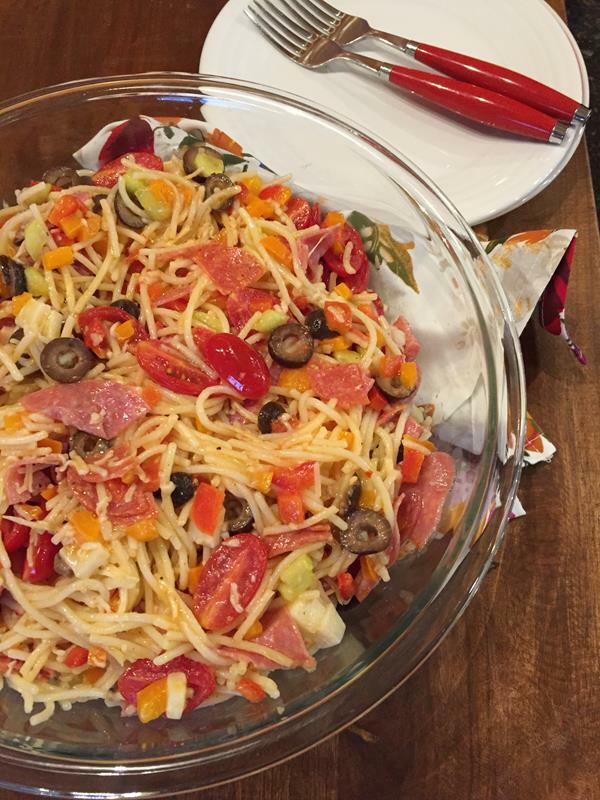 Now for the Italian Spaghetti Salad Recipe. 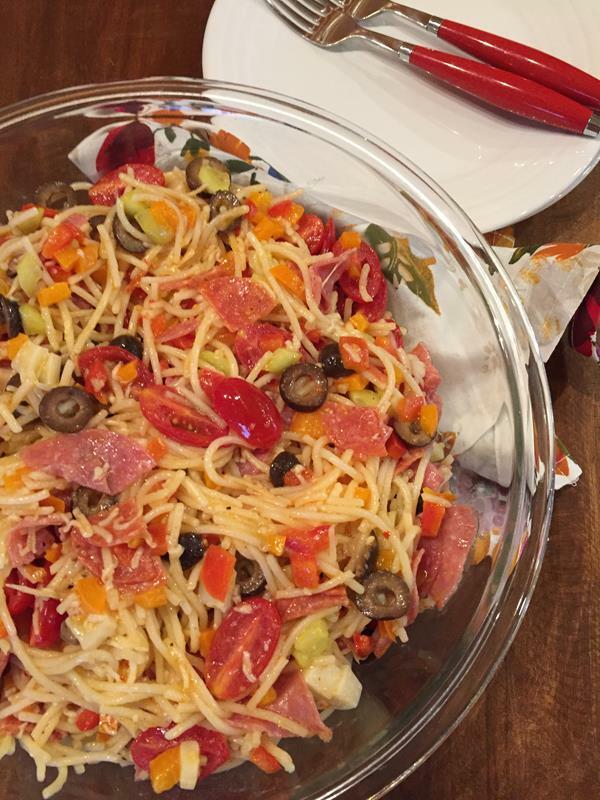 If you love pasta salad this is a must make for summer! A quick and easy dinner perfect for summer. The leftovers make a great lunch. Cook spaghetti according to directions. Drain and place in a large bowl. Add Italian dressing and stir to coat pasta well. Add remaining ingredients and stir just until ingredients are combined. Refrigerate for several hours before serving.